Did you know that the #DeliveryManMovie is actually a remake. Starbuck is the French Canadian version of the film that was released in 2011. Interestingly, the director then was also Ken Scott. So when Ken Scott came to meet us, I had a burning question in my mind. 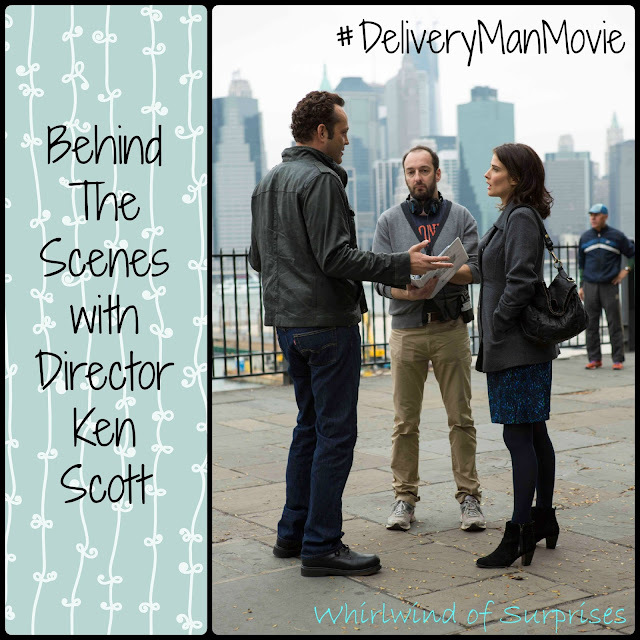 First though, let’s tell you what Delivery Man is about. According to Ken Scott, it’s the story of a 42 year old adolescent (Vince Vaughn) who has a pregnant girlfriend (Cobie Smulders) and she’s leaving him. Around the same time, an attorney shows up telling him that 20 years ago, he donated in a fertility clinic, a LOT at a fertility clinic. Apparently, “he has high quality sperm” so now he’s the biological father of 533 kids who all want to know who he is. That’s a comedy in itself waiting to happen, right? Back to my questions…I wanted to know how Delivery Man would be similar or different than Starbuck, if it’s more challenging filming in English now than French, and the perceived challenges in remaking his own movie. Ken Scott responded by telling me that this would be quite special since the original movie that he also co-wrote is now coming out throughout the world. Ken admitted that there weren’t many incidences “of a director re-doing his own movie.” He took an unique approach that included watching Starbuck with an American audience as they went to different film festivals. The original had won the Audience Award at the Palm Springs Film Festival, Sonoma Film Festival and Santa Barbara Film Festival. He realized that it could work as the same story but integrated into the American culture. The challenge though lay in directing the remake. Ken wanted to make sure that he wasn’t just copying something but at the same time, he didn’t want to make “something different just for the sake of making something different.” To simplify things, Director Scott went about filming Delivery Man as if he had never made Starbuck. He’s just going through the same process as if he was filming the movie for the first time. New York City was, for Ken Scott, “the greatest place to shoot this movie” because 533 kids all have to live in the same city. We all laughed because he’s so right. With the size of NYC and the diversity available, each kid could live in a different neighborhood and because of that, you’d have very different characters for the kids. So they ended up filming all over NYC. You may be wondering where the idea for this movie came from. I was wondering the same. Well, Ken has 3 kids; the co-writer also had 2 kids. They felt they “had a lot to say about fatherhood.” So they did! The funny thing though is that they wouldn’t have written the same script 15 years ago. It was exciting for them to be writing about something that seemed to be changing in society. Catch this hilarious romantic comedic in theaters Nov 22, 2013.